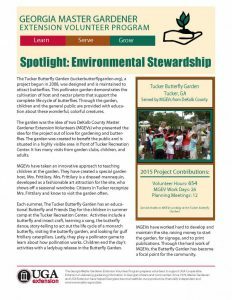 Last year, as Sarah and I worked on the annual report for Georgia’s MGEV Program, we wanted to include more information about how MGEVs educate the public. Since the project is the essence of MGEV outreach, we needed a way to learn more about MGEV projects. I wanted examples of projects that were addressing our state initiatives, or educational priorities, that could be linked to our program website to clearly communicate the educational focus that our MGEV program has. You know, a picture is worth a thousand words, right? So, pictures and a few words would better explain what we endeavor to do through our projects and programs for the public. Sarah and I spent hours studying the information that you have recorded in MGLOG. We looked at project lists for each state initiative, considered the counties where projects were being conducted, and pulled up hours volunteered on the project. We still had lots of questions about the projects, but knew that we had to refine our focus. There are so many MGEV projects!! We wanted to represent the state geographically as well as projects of all sizes from diverse local MGEV programs. We used what we knew about the projects to select 3 per initiative to explore more in depth. When we arrived at 18 projects, we sent a request for more information to the Extension agent and project coordinator for each chosen project. We were, in essence, interviewing the project! When the responses came back with photos, we felt like we were really understanding what the projects were all about. 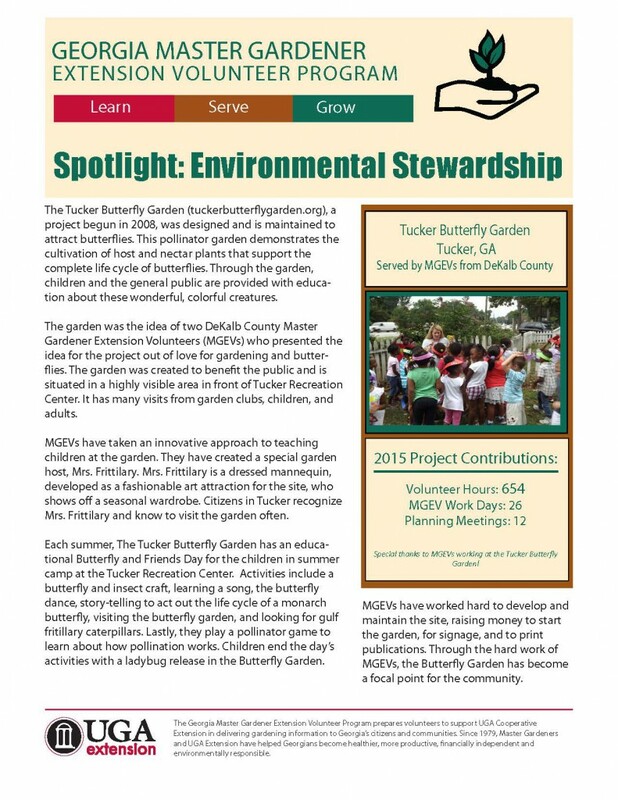 Not only were we able to put great stories and details in our expanded 2015 annual report, but we were able to present project examples on the state program website so that we could better explain to the public what our volunteers do (you can see an example here). These stories put the spotlight on MGEV projects. Hence, the “Project Spotlight” was born! 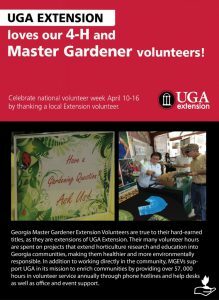 MGEV Project Spotlights were used in UGA Extension’s social media campaign for 2016’s National Volunteer Week celebrations. These spotlights were increasingly useful! 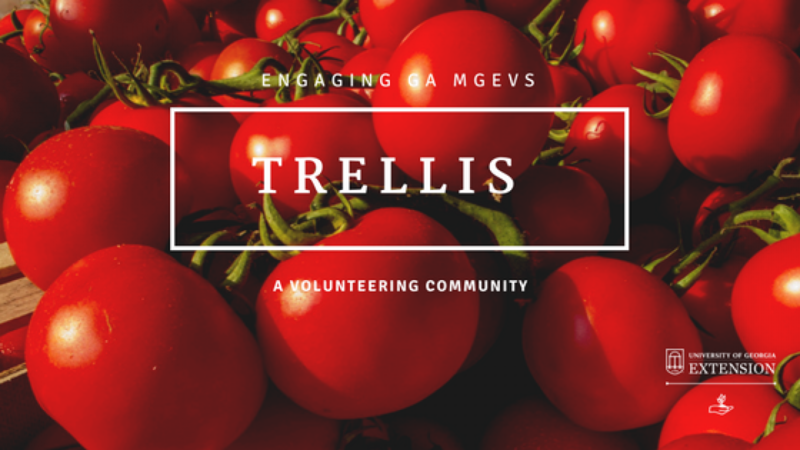 We shared links to these stories through our Facebook page, bragged about them here on Trellis, and featured them in UGA Extension’s social media posts during the 2016’s National Volunteer Appreciation Week. Again and again, we were able to use these examples to tell our story of how MGEVs partner with Extension to deliver research-based horticulture and gardening information to the public. Since there were plenty more projects to learn about, we continued the “Project Spotlights” in 2017! We went through the same process, selecting 14 projects that exemplify our state initiatives. Thanks to Sarah’s hard work and the contributions of project coordinators and Extension agents, these Spotlights have been posted on the Georgia MGEV Program website, linked to the state initiative to which they are assigned. Take a few minutes to read through them (in case you missed the 2016 spotlights, they are still there, too!). You may gain new ideas for a similar project, be encouraged the work that you are doing, or want to start a new project altogether! Congratulations to our 2017 Project Spotlight honorees! Thank you for sharing your project with us! Posted in Projects. Bookmark the permalink. Previous: Considering a Help Desk?